Let me tell you, quilting is not always the easiest or cleanest activity to take interest in. I have so many scraps and unfinished projects just laying around. Sometimes they are not even unfinished, just laying around! A person can only give away so many quilts and a person only has so many rooms to furnish with quilts, so my less favorite projects usually do not seem much of the light of day. I decided that I wanted to find ways to really change my perspective on these quilts and make them better. I do not necessarily need more, though more will definitely happen, but I can better the ones I have! One of the ways I learned to do this is by adding a simple, or not so simple depending on your taste, border to the quilts that are lacking in some way. It has made all the difference! I took a black and white quilt that I had and added a fabulous teal border and the whole thing just came alive! So, today I am presenting you with a Melanie Ham video tutorial on how to add a border to the top of a quilt. This skill can really come in handy, not only for those of us who are just adding a little something extra, but definitely for any beginners out there who may not have it completely down yet. 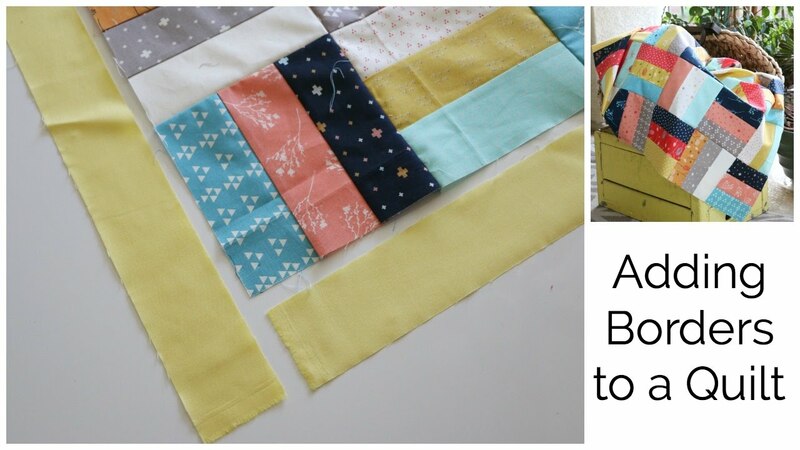 I find that a lot of videos can give beginners simple block ideas, but kind of skip the other parts that are great about making a quilt. Melanie can really help bring the border part into perspective with this video. She does a great job explaining and going through all the motions with us and she is so upbeat which makes it really fun! Check out the video, it really is great and spice things up with your borders!